One of the numerous cactus in bloom. Temp at begining was 68, sunny and light wind. Temp at end was 88, sunny and steady wind. Leisurely hike in the park's mid-section. A lot of the area was burned during the past Winter and up until a few short weeks ago, everything seemed black and barren with occasional spots of green. 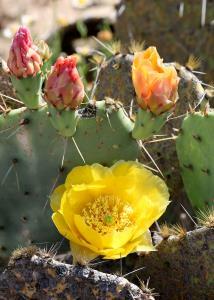 After last week's rain, there is much more green in view as well as numerous cactus in bloom. The trails are dry, easy to see and traverse. No snakes spotted although there were a few lizards scampering about as well as quite a few birds singing for mates. Not much else to say except any hike is a good hike. Water and shade available at Bell's Point. Water, shade and info kiosk available at 5 Points Junction.